Let us help you relax in style. St. Martin/Maarten is an island for all ages. With zip lines, butterfly farms, water safaris and beach playtime, there is quite literally something to do for visitors of all ages. Anguilla is an island of natural beauty, and environmental stewardship, whereby they aim to obtain 15% of their energy from solar power. A truly forward-thinking island! St. Barts is luxurious and peaceful. A desirable vacation spot for the famous, so you can be assured of peace and tranquility. Come enjoy valued time with your family, and relax in the beauty of the Caribbean. For employers looking to reward their top performing staff and work in some brainstorming and team-building, we have villas to help. What better way to create an atmosphere of creativity, than through a tranquil oasis in the Caribbean. Build your 5 year plan in the beauty of the Caribbean. Get back to the beauty of marriage. Avoid the stresses of big city weddings, and have the most beautiful backdrop possible. Have a professional make all the preparations. Combine your wedding with your honeymoon. 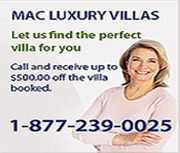 We have villas for that. Book now and save up to $2,000! Book 7 nights at Jardin Creole Villa and save up to $2,000. Availability: Jan. 18 – 25; or anytime between Feb. 9 – 21. Email us, or call directly at 1-877-239-0025.